Very tight and twisty with lots of up and down. More difficult then near by Pontiac Lake Recreation Area. Review: As others said, this trail makes you work! It seems like you don't get much time for recovery so you are trying to push up a hill when you only get a few minutes to catch your breath before the next. During those few minutes it's twisty, technical turns with an occasional nice downhill. Lots of roots and rocks to go around/over and some logs tossed in for good measure. It is fun but challenging for sure. I wouldn't take a beginner here and intermediates will be pushed. Review: This trail is quite a workout. It's tight turns often at low points makes you scrub most of your speed so you have to crank up most of the hills. Torn Shirt in Brighton makes you work the same way. Review: If you like technical trails with lots of tight and twisty turns you will like this trail. 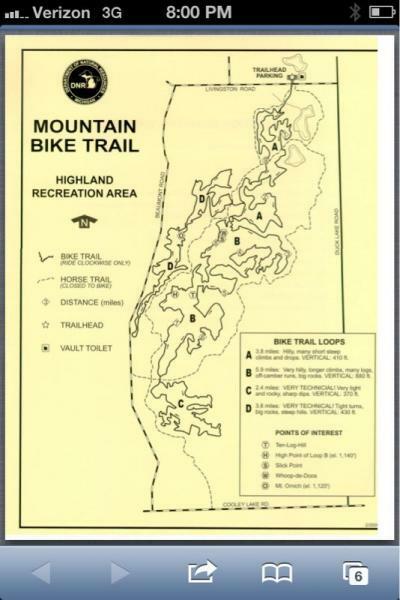 Highland Recreation Area MTB Trail 4.33 out of 5 based on 3 ratings. 3 user reviews.